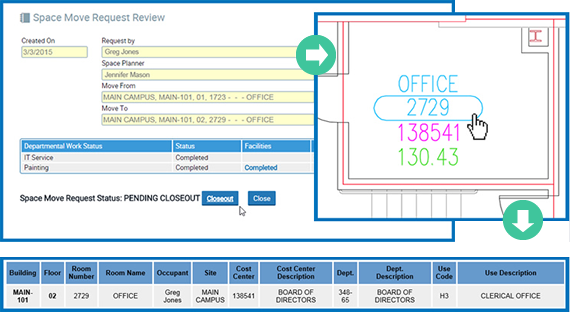 Automate coordination of space move data across any campus or healthcare system. More than half of U.S. hospitals plan to repurpose space this year, and fully one -third will allocate capital to new construction. Advanced Technologies Group, Inc. has announced the development of a Space Move Management (SMM) solution to help those healthcare systems meet the highly complex needs of these space reallocations. The ATG SMM solution automates cumbersome manual space move management processes and allows facility personnel to reliably manage move requests, maintain control of space inventory and compliance, prevent costly errors, and avoid needless delays. SMM automates coordination of essential space move data across any campus or healthcare system for any size move, improving safety and regulatory compliance. It maintains accuracy for CMS reporting, space planning and management through automation, tracking and coordinated reporting. The solution minimizes inefficiencies, reduces costs, and improves accuracy by replacing paper documentation with user-friendly mobile technology. ATG will demonstrate this solution at the PDC Summit in San Diego, CA, March 20-23, Booth 722. Members of the press are invited to schedule an exclusive showing by contacting Theodore T. Pappas. For nearly 30 years, ATG has provided healthcare and higher education institutions nationwide with the mission-critical knowledge to better manage their facilities — supporting planning, design, regulatory compliance, yield and risk management. Servicing over 300 million square feet of facility space, ATG clients can access and act upon accurate information in real-time through cloud-based mobile technology solutions, leading to more informed decisions that raise the performance and efficiency of space, operations, and personnel. ATG is the Measure of Innovation. Learn more at atginc.com. Space Move Manager gives hospitals a tool to improve planning and reduce risk during critical moves across a campus or healthcare system.ATG's expertise and cloud-based technologies help planners maintain compliance and eliminate risk and loss.